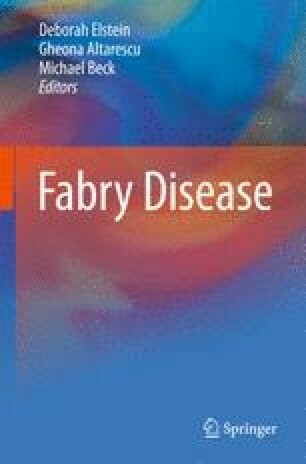 Fabry disease (FD) is a lysosomal storage disorder (LSD) with multisystem manifestations among which skin lesions are common and well-recognized. They may appear early in childhood in both hemizygous males and heterozygous females, their frequency increasing with age. In addition to dermatological lesions, normal-looking skin, as occurs with other tissues, accumulates unmetabolized products in multiple cells of different embryonic origin with variable distribution, biochemical and staining properties and morphological features, according to the type of stored material and the physiopathology of the disease. Globotryaosil-ceramide (Gb3), the most abundant glycosphyngolipid accumulated in FD, can be specifically documented with immunocytochemical methods using a particular monoclonal antibody. On the other hand, ultrastructural characteristics of Gb3 and its distribution in dermal cells are well-defined. Furthermore, the study of unmyelinated and small myelinated fibers in epidermal nerve endings is a reflection of the impaired sensory innervation and the characteristic painful neuropathy present in FD. Therefore, a combination of different technologies in tissues obtained with noninvasive techniques, such as skin biopsy, is advisable and should be considered in order to obtain better insights into FD. This is essential in the case of heterozygous women in whom biochemical diagnosis is often controversial. To all patients and their families for their generous and disinterested cooperation. To James Stilwell-Stronge for his help with the English version of this work and to Tania Vázquez for editorial assistance. This work was supported in part by grants from Fondo de Investigacion Sanitaria (PI07/1257 and PI07/90043) and Xunta de Galicia (PGIDIT06PXIB905328PR, INCITE07PXI905221ES and PS08/38).